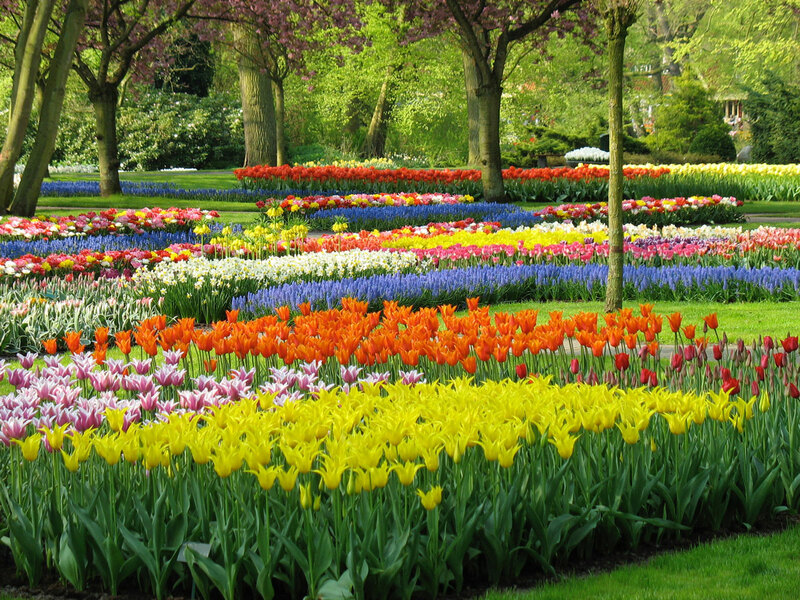 Keukenhof is the world’s largest and most colorful spring flower garden. 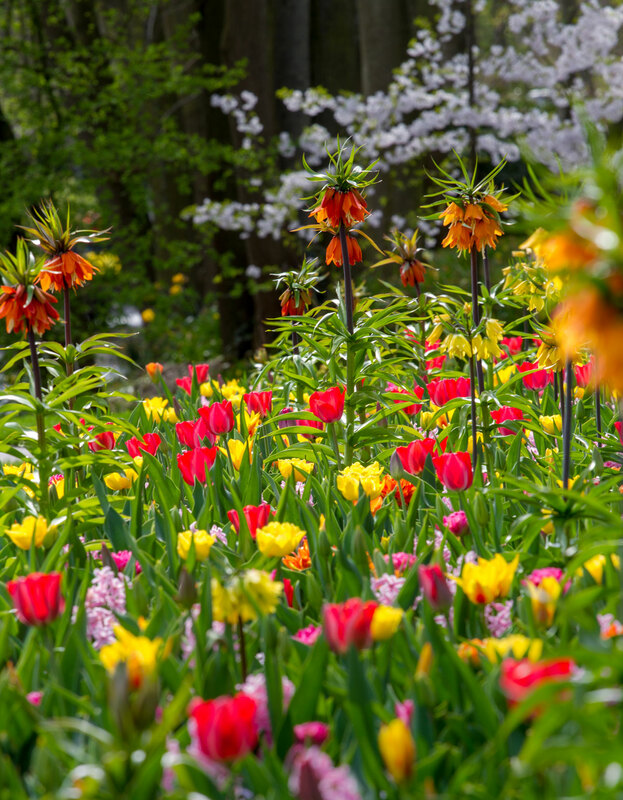 In a park-like setting that covers 79-acres, you can wander through more than 7 million tulips, daffodils, hyacinths, muscari, fritillaria and other spring-flowering bulbs. If your eyes are hungry for spring color, this is where to find it! There are many remarkable things about Keukenhof. Starting with the fact that the entire garden is completely replanted every year. 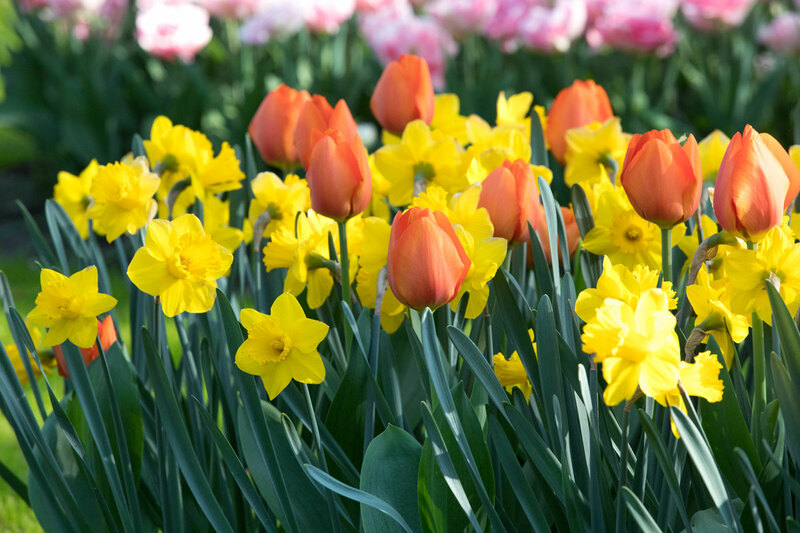 After the bulbs finish blooming in spring, they are dug out so that another 7 million fresh bulbs can be planted in the fall. What makes this extravagance possible is the fact that Keukenhof is not a typical public garden. It’s a commercial venue for showcasing Holland’s floraculture industry. 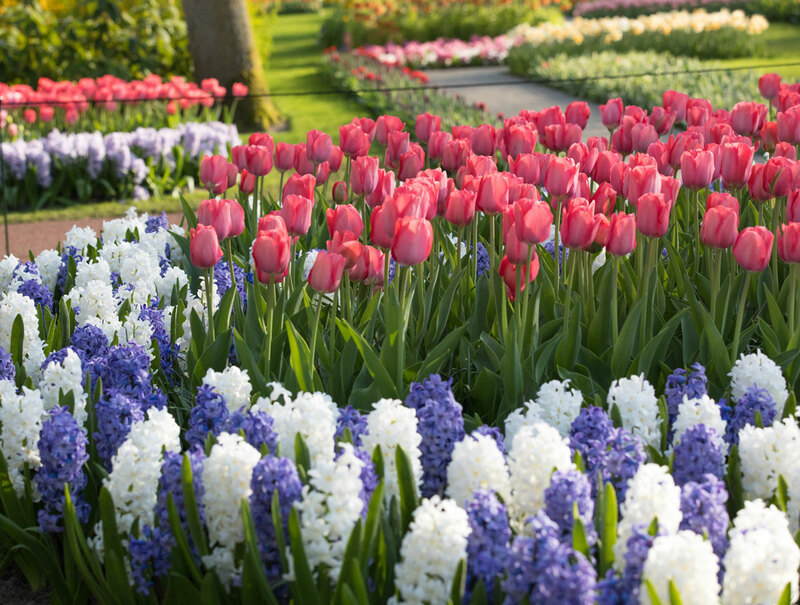 Each fall, Dutch bulb growers and distributors donate the bulbs and collaborate on designing the garden to highlight new varieties, color trends and planting combinations. It’s fun to see that color combinations you’d never think could work, often do. 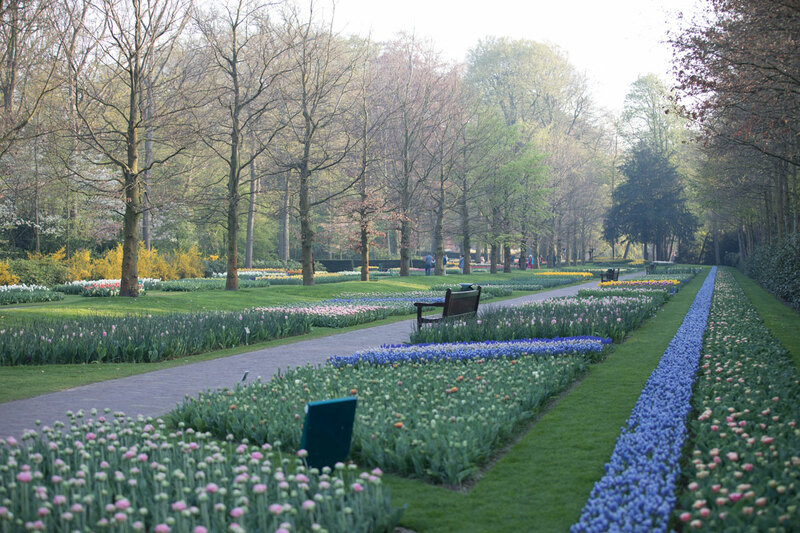 The grounds now occupied by Keukenhof were once part of a nearby estate and today they feature a network of towering shade trees, tranquil lakes, brick paths, emerald green lawns and pavilions for special floral displays. 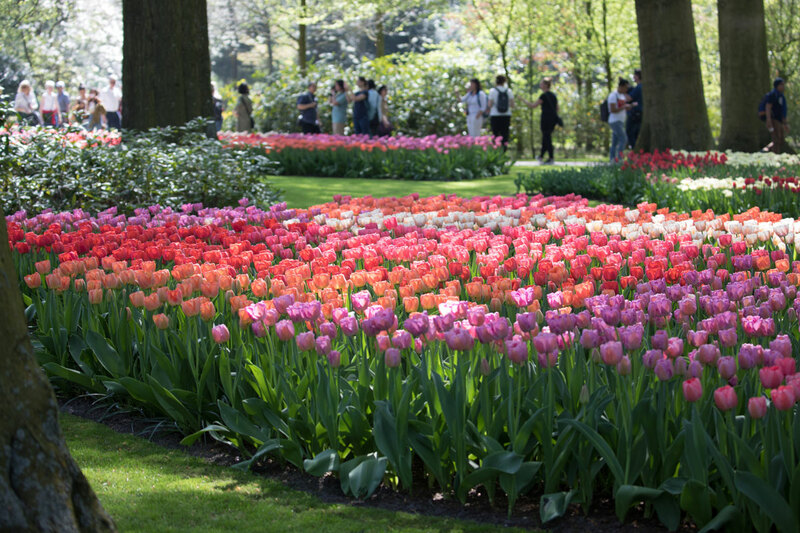 During the 8 week period that the gardens are open to the public, Keukenhof receives as many as one million visitors from 100 different countries around the world. The recently expanded parking lot can now accommodate 4500 cars and 1000 buses! 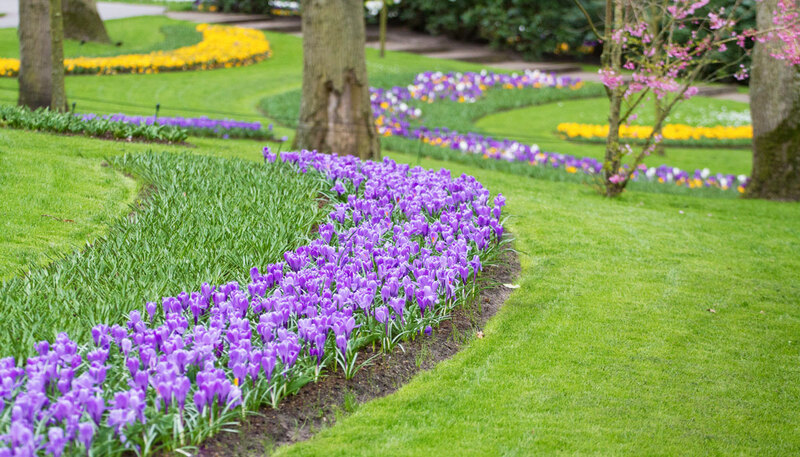 The springtime weather in Holland is just as unpredictable as it is in most of the U.S. On opening day, temperatures may only reach 40°F, yet three weeks later, they can climb into the mid-70’s. Typically the weather settles down by the last week of April. 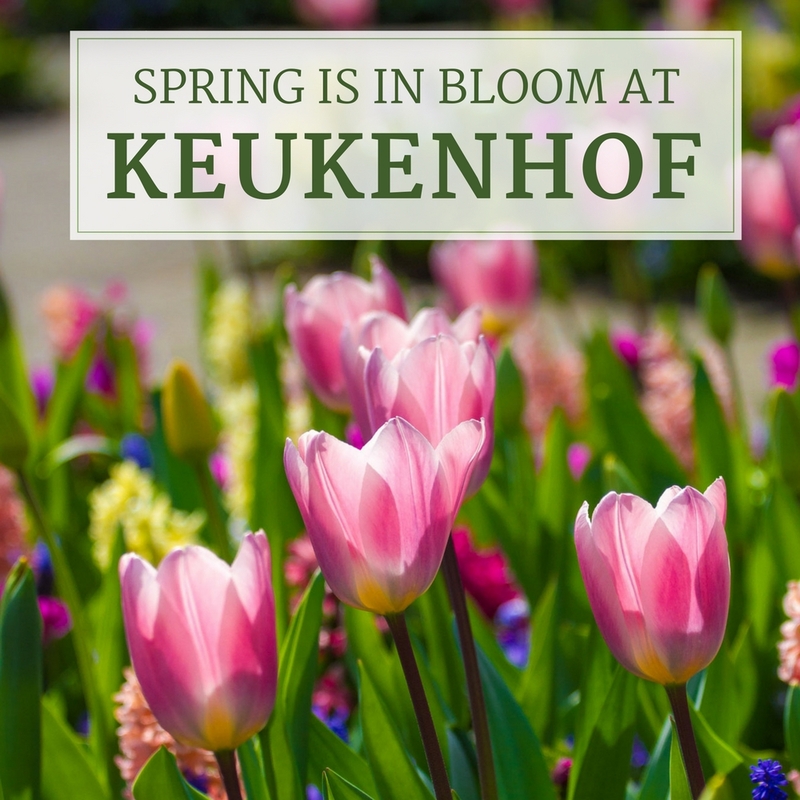 If there’s a best time to visit Keukenhof, it’s right around then. 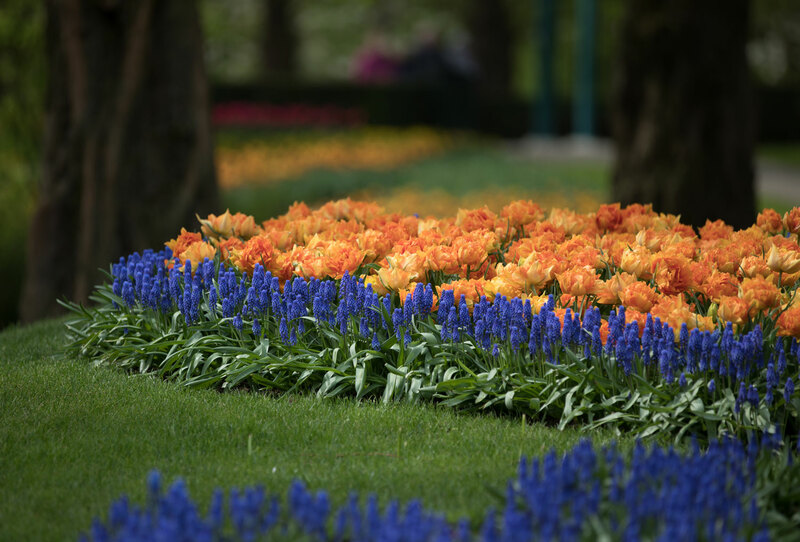 When Keukenhof first opens in late March, what’s most visible is the neatness of the beds, the lush green lawns and bands of purple and yellow of crocus. By the next week there are hyacinths galore, plus early daffodils and the first tulips. A pretty rendition of red, white and blue. Notice how hyacinth ‘Blue Jacket‘ picks up the blue highlights in triumph tulip Judith Leyster. Longfield Gardens takes full advantage of what Keukenhof has to offer. Members of our staff are usually on site several times during the season to see what’s new, meet with growers and take photographs. Ribbons of color delight the eyes. Here are some of the plantings we found most appealing. Watch for some of these pairings in our new collections for fall. A sweet combination of Candy Prince and Purple Prince tulips. The underplanting of white anemones and Purple Sensation hyacinths completes this harmony of colors. Another wonderful color echo. 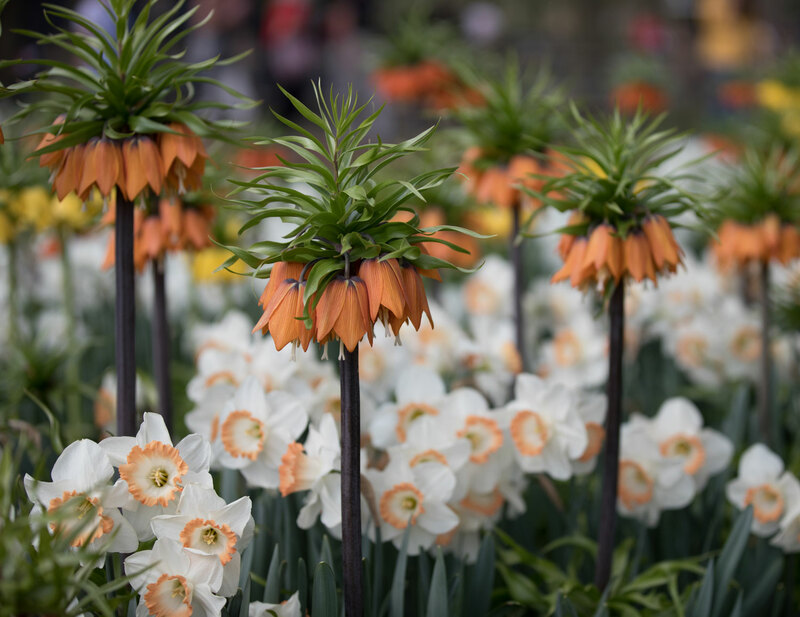 Fritillaria rubra maxima paired with salmon-cupped daffodil Pink Charm. This is triumph tulip Just Kissed. It’s similar to Del Piero. Both are stunning, especially planted by the hundreds. Complementary colors are always eye-catching. This is muscari armeniacum with early double tulip Monte Orange. Here’s another unexpected color combination that took some courage. What a reward! 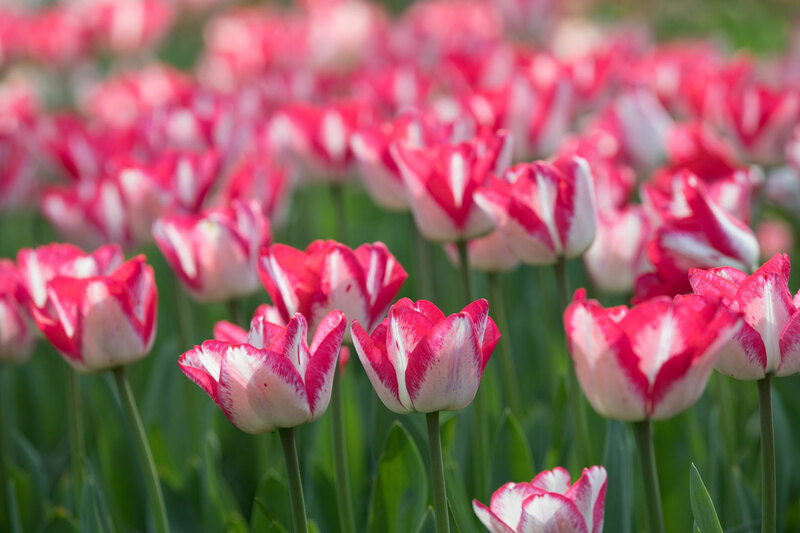 The key to making this planting work is the coral pink tulip Toronto. It’s the one in foreground with the smoky blue flares. It may seem early to be ordering bulbs for fall planting, but we are already accepting pre-orders. 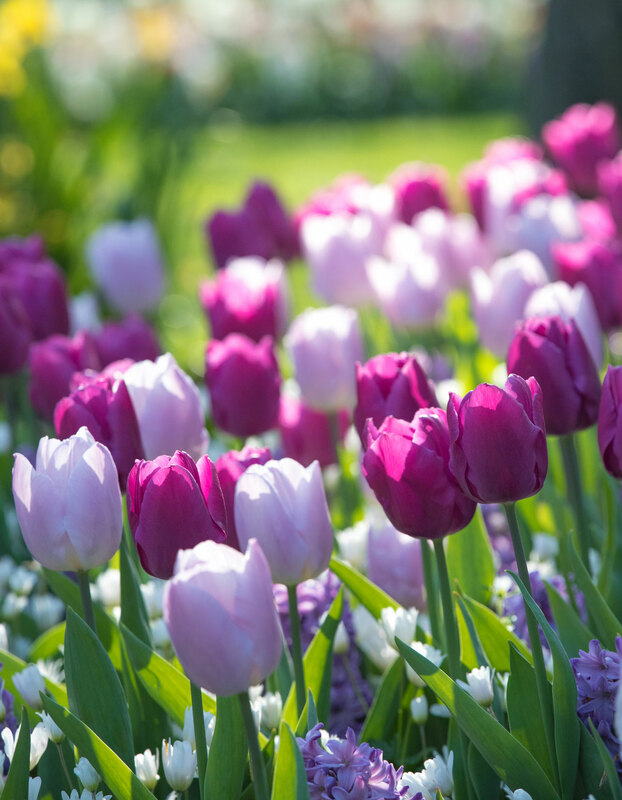 Certain varieties of tulips always sell out early, so it’s best to have us set yours aside. 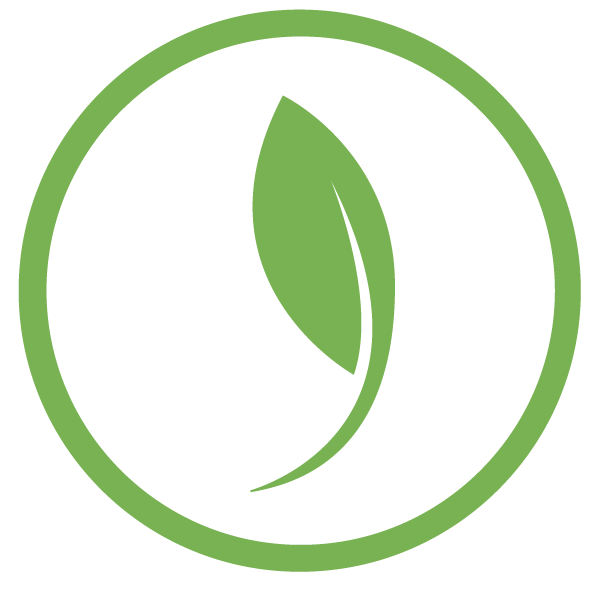 There’s no charge to you until your bulbs are shipped at the proper planting time next fall. Wherever you are this spring, we hope it’s looking colorful! Breath taking! Wish you were located in the United States! 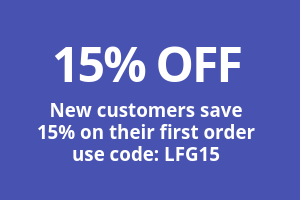 Hi Jackie – Longfield Gardens is located in the U.S. We are based in Lakewood, NJ. 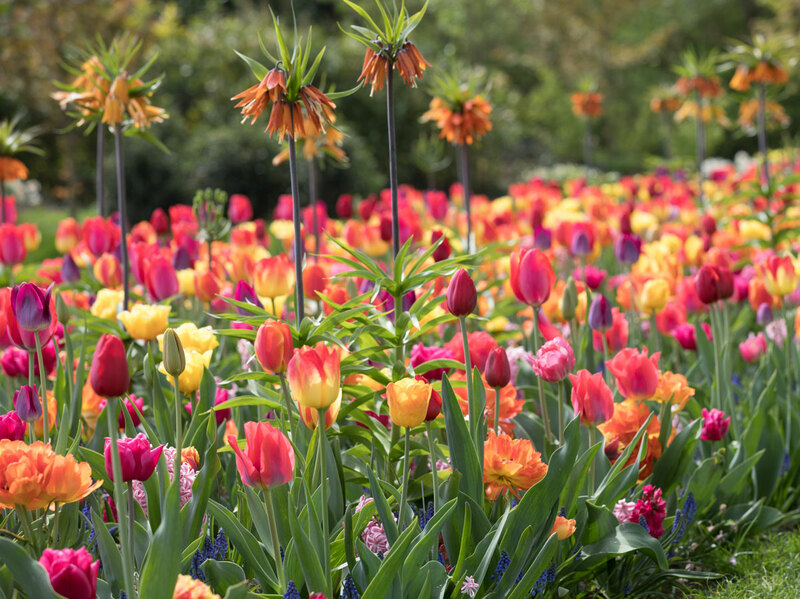 Many of the bulbs we sell are imported from Holland and we visit the Netherlands every spring to meet with growers, assess new varieties, work on new combinations and take photos.